Are you teaching (or preparing to teach) a unit on argumentative writing? Are you interested in having your students write a book review that argues why a peer should or should not read their independent reading text? If so, this resource is for you! 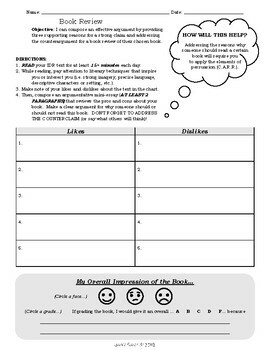 This document contains both a during reading graphic organizer for students to trace evidence of what they like and dislike about their independent reading text. 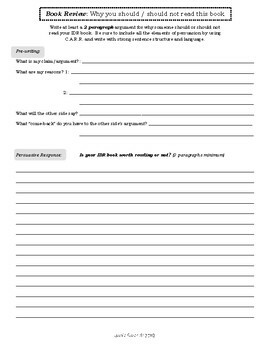 Then, the back of the document provides a pre-writing and persuasive short answer response section to walk your students through the process of writing a 2-paragraph argument for their book. Great to use as a pre-assessment before moving into an argumentative writing unit or as a formative assessment while instructing the components of this type of writing.